The Alaafin of Oyo, Oba Lamidi Adeyemi, has appointed the National Coordinator of the Oodua People’s Congress (OPC) Gani Adams, as the 15th Aare Ona Kakanfo of Yorubaland. Making the declaration on Sunday, in his palace, Alaafin said a letter of appointment had been issued to Gani Adams. The Aare Oba I Kakanfo, which is the office of the Generalismo of Yorubaland, was last held by Nigeria’s business mogul, and unofficial winner of June 12, 1993 presidential election, the late Chief M.K.O Abiola. Abiola died in the detention camp of the late Nigeria’s military dictator, Gen. Sani Abacha, in 1998 for refusing to officially denounce his call for affirmation of his presidential mandate which was annulled by former military dictator, Gen. Ibrahim Badamasi Babangida. 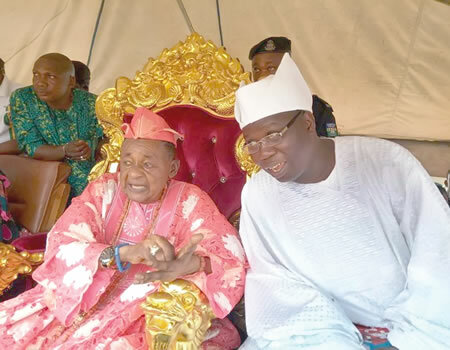 The announcement of Gani Adams came as part of the side attractions to the celebration of the 79th Birthday of Alaafin, which held in Oyo palace at the weekend.